The Milky Way galaxy is most significant to humans because it is home sweet home. But when it comes down to it, our galaxy is a typical barred spiral, much like billions of other galaxies in the universe. Let's take a look at the Milky Way. A glance up at the night sky reveals a broad swath of light. Described by the ancients as a river, as milk, and as a path, among other things, the band has been visible in the heavens since Earth first formed. In reality, this intriguing line of light is the center of our galaxy, as seen from one of its outer arms. [Pin It] This picture of the nearby galaxy NGC 6744, a Milky Way look-alike, was taken with the Wide Field Imager on the MPG/ESO 2.2-metre telescope at La Silla. Unlike a regular spiral, a barred spiral contains a bar across its center region, and has two major arms. The Milky Way also contains two significant minor arms, as well as two smaller spurs. One of the spurs, known as the Orion Arm, contains the sun and the solar system. The Orion arm is located between two major arms, Perseus and Sagittarius. The Milky Way does not sit still, but is constantly rotating. As such, the arms are moving through space. The sun and the solar system travel with them. The solar system travels at an average speed of 515,000 miles per hour (828,000 kilometers per hour). Even at this rapid speed, the solar system would take about 230 million years to travel all the way around the Milky Way. Life can exist in what were previously thought to be impossible environmental conditions here on Earth, meaning life on other planets in our solar system and beyond could be more widespread than earlier believed, scientists say. NASA scientist Christopher McKay has published a paper that includes an expanded checklist of possibilities that life could exist on distant planets or moons. Studies on Earth have suggested not all forms of life require the conditions we most commonly experience around us, McKay says, and some are able to survive and even thrive while living in extreme conditions. Since we have had to expand our consideration of the existence of such extreme life forms in extreme conditions on Earth, it is logical to do the same for other, more distant places as well, he says. For example, he says, because some earthly micro-organisms survive in environments consistently above the boiling point or below freezing, the search for extraterrestrial life shouldn't rule out any planets simply because they're too old or too cold. Nor should we rule out a planet because it's too far from its star for light as an energy source to reach potential life, he says, since some creatures on Earth live so deep in the sea that sunlight never reaches them. Think you know how our solar system moves, with planets revolving around the Sun? Well, think again. The galaxy is also moving the same way, and so is the universe probably. There may actually be a bunch of universes all moving the same way just like moons around the planets or planets around the sun or stars around the galaxy. And if there is something bigger than a universe it is probably moving around also with all the other bigger-than-universe things that are out there. Andromeda and the Milky Way Collide! In about five billion years time, nearby massive galaxy Andromeda will merge with our own galaxy, the Milky Way, in an act of gallactic cannibalism (technically Andromeda will be eating us, as it's the bigger of the two galaxies.). There haven't been any large mergers with our galaxy recently, but we can see the remnants of galaxies that have previously been snacked on by the Milky Way. We're also going to eat two nearby dwarf galaxies, the Large and Small Magellanic Clouds sometime in the future. Simulation Credit: Prof Chris power (ICRAR-UWA), Dr Alex Hobbs (ETH Zurich), Prof Justin Reid (University of Surrey), Dr Dave Cole (University of Central Lancashire) and the Theoretical Astrophysics Group at the University of Leicester. Video Production Credit: Pete Wheeler, ICRAR. Scientists already knew that big galaxies like to chow down on smaller ones -- which is just a cute way of saying that when they collide, the larger galaxy gains the mass of the smaller one. According to a new study published in the Monthly Notices of the Royal Astronomical Society, galaxies turn to cannibalism when they get too big to keep growing on their own. "All galaxies start off small and grow by collecting gas and quite efficiently turning it into stars," Aaron Robotham, a postdoctoral researcher at the International Centre for Radio Astronomy Research and head of the study, said in a statement. "Then every now and then they get completely cannibalized by some larger galaxy." As galaxies grow, they get worse at making new stars -- but they also have stronger gravity, which helps them pull neighbors into the fold. The Milky Way reached this tipping point "recently," in cosmic terms (read: not at all recently) and will now grow mostly by snacking on the little guys. It's been a while since our neighborhood ate another one, but astronomers can still see the signs of former galaxies that we've digested. "Billions and billions" of stars in a galaxy (after a quote often mistakenly attributed to Carl Sagan) is how many people imagine the number of stars you would find in one. Is there any way to know the answer for sure? "It's a surprisingly difficult question to answer. 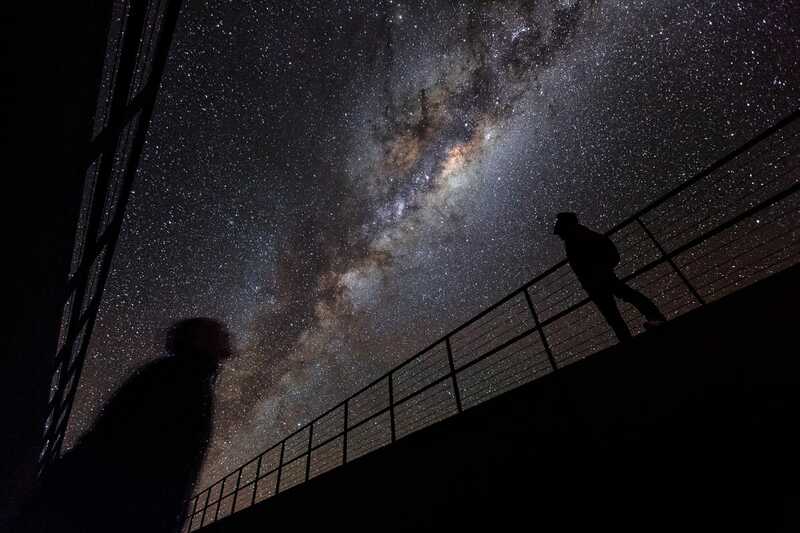 You can't just sit around and count stars, generally, in a galaxy," said David Kornreich, an assistant professor at Ithaca College in New York State. He was the founder of the "Ask An Astronomer" service at Cornell University. The ideal would be using a telescope in orbit because scattering occurs in Earth's atmosphere from light pollution and also from natural events — even something as simple as a sunset. The Hubble Space Telescope is one observatory known for this sort of work, Kornreich added. Image of the Day --The Oldest Spiral Galaxy in the Universe? "BX442 looks like a nearby galaxy, but in the early universe, galaxies were colliding together much more frequently," says Alice Shapley, a UCLA associate professor of physics and astronomy. "Gas was raining in from the intergalactic medium and feeding stars that were being formed at a much more rapid rate than they are today; black holes grew at a much more rapid rate as well. The universe today is boring compared to this early time. As you go back in time to the early universe, galaxies look really strange, clumpy and irregular, not symmetric. The vast majority of old galaxies look like train wrecks. Our first thought was, why is this one so different, and so beautiful?" In July of 2012, astronomers observed a spiral galaxy in the early universe, billions of years before many other spiral galaxies formed while using the Hubble Space Telescope. They were taking pictures of about 300 very distant galaxies in the early universe to study their properties. This distant spiral galaxy they discovered existed roughly three billion years after the Big Bang, and light from this part of the universe has been traveling to Earth for about 10.7 billion years. Galaxies in today's universe divide into various types, including spiral galaxies like our own Milky Way, which are rotating disks of stars and gas in which new stars form, and elliptical galaxies, which include older, redder stars moving in random directions. The mix of galaxy structures in the early universe is quite different, with a much greater diversity and larger fraction of irregular galaxies, Shapley said. "The fact that this galaxy exists is astounding," said David Law, lead author of the study and Dunlap Institute postdoctoral fellow at the University of Toronto's Dunlap Institute for Astronomy & Astrophysics. "Current wisdom holds that such 'grand-design' spiral galaxies simply didn't exist at such an early time in the history of the universe." A 'grand design' galaxy has prominent, well-formed spiral arms. The galaxy, which goes by the not very glamorous name of BX442, is quite large compared with other galaxies from this early time in the universe; only about 30 of the galaxies that Law and Shapley analyzed are as massive as this galaxy. To gain deeper insight into their unique image of BX442, Law and Shapley went to the W.M. Keck Observatory atop Hawaii's dormant Mauna Kea volcano and used a unique state-of-the-science instrument called the OSIRIS spectrograph, which was built by James Larkin, a UCLA professor of physics and astronomy. They studied spectra from some 3,600 locations in and around BX442, which provided valuable information that enabled them to determine that it actually is a rotating spiral galaxy — and not, for example, two galaxies that happened to line up in the image. A massive population of stars is missing, and scientists are stumped as to where it could be. New observations from the Hubble Space Telescope challenge a previous theory for the apparent disappearance of a massive number of stars. Because some star clusters around our Milky Way galaxy have fewer stars than observations suggest they should, astronomers suspected many of these stars were ejected from their clusters to ultimately find new homes in the Milky Way. But the new Hubble telescope views of the distant Fornax galaxy cluster challenge this picture. That's because, in the case of Fornax, such ejected stars would have nowhere to hide. "If these kicked-out stars were there, we would see them — but we don't!" Frank Grundahl of Aarhus University in Denmark, a co-author on the paper, said in a statement. The finding draws into question whether the missing stars were ever present at all, in globular clusters around Fornax or the Milky Way. Globular clusters are dense balls of stars that usually orbit galaxy centers but lie far away from those centers. They are ancient denizens of the universe, containing some of the oldest living stars. Astronomers once thought the stars in each of these clusters must have all formed together, at about the same time. But observations of globular clusters near the Milky Way revealed that roughly half the stars are old, while the other half are much younger. These younger, second-generation stars are polluted with levels of nitrogen and other materials not seen in the first-generation stars, observations showed. This necessitated changes to the formation story of the clusters: Astronomers say it indicates that the young stars formed from material ejected by the older stars, meaning there should be significantly more old stars than young. But this doesn't fit with the observations that the globular clusters have roughly a 50/50 split of old stars and young. This missing population of first-generation stars isn’t entirely unexplainable near the Milky Way, which itself has a high population of old stars. The stars from the clusters could have been ejected and simply taken up residence on the outskirts galaxy, blending in nicely with the population, as scientists have hypothesized. But this can't explain new observations of the Fornax globular clusters, which do not exist near a galaxy with a high population of old stars. The Fornax clusters 1, 2, 3 and 5 orbit the Fornax dwarf galaxy, located roughly 62 million light-years from Earth. The ratio of young stars to old is roughly the same in these clusters as it is in the clusters near the Milky Way (other star clusters have different mixtures of star ages). This led astronomers to believe the Fornax clusters formed in the same way: The younger stars were born of material from the older stars, and many of the older stars were then ejected. But if the stars were ejected, where did they go? Unlike the Milky Way, the galaxy these clusters orbit does not contain enough old stars to account for the huge number that must have been ejected from the clusters. In other words, there's nowhere for the stars to hide. The findings are leading astronomers to question their theories about globular clusters near the Milky Way. What if the missing stars aren't hiding in the galaxy? What if the "missing" stars never existed? And if that's the case, how did the second-generation of stars form? "Our leading formation theory just can't be right," said Grundahl. "There's nowhere that Fornax could have hidden these ejected stars, so it appears that the clusters couldn't have been so much larger in the past." It appears that scientists will have to go back to the drawing board and rethink how these types of globular clusters form. The new work is detailed in a paper published Nov. 20 in The Astrophysical Journal. "The Messier 67 Mystery" --Is Our Solar System an Orphan from a Distant Star Cluster? Astronomers over the decades have been searching for star clusters that could have shared our original region of the galaxy that come close to matching the composition and age of our Sun. The prime suspect so far One is a collective known as Messier 67, some 2,700 light-years distant that contains more than a hundred stars that bear a striking resemblance to the Sun. This cluster lies about 2500 light-years away in the constellation of Cancer (The Crab) and contains about 500 stars. Many of the cluster stars are fainter than those normally targeted for exoplanet searches and trying to detect the weak signal from possible planets pushed HARPS to the limit. This past January, astronomers used the ESO's HARPS planet hunter in Chile, along with other telescopes around the world, to discover three planets orbiting stars in Messier 67. Although more than one thousand planets outside the Solar System are now confirmed, only a handful have been found in star clusters. Remarkably one of these new exoplanets is orbiting a star that is a rare solar twin — a star that is almost identical to the Sun in all respects. Up to now, very few planets have been found inside star clusters. This is particularly odd as it is known that most stars are born in such clusters. Astronomers have wondered if there might be something different about planet formation in star clusters to explain this strange paucity. Star clusters come in two main types. Open clusters are groups of stars that have formed together from a single cloud of gas and dust in the recent past. They are mostly found in the spiral arms of a galaxy like the Milky Way. On the other hand globular clusters are much bigger spherical collections of much older stars that orbit around the centre of a galaxy. Despite careful searches, no planets have been found in a globular cluster and less than six in open clusters. Exoplanets have also been found in the past two years in the clusters NGC 6811 and Messier 44, and even more recently one has also been detected in the bright and nearby Hyades cluster. Anna Brucalassi (Max Planck Institute for Extraterrestrial Physics, Garching, Germany), lead author of the new study, and her team wanted to find out more. "In the Messier 67 star cluster the stars are all about the same age and composition as the Sun. This makes it a perfect laboratory to study how many planets form in such a crowded environment, and whether they form mostly around more massive or less massive stars." WHAT PART OF THE MILKY WAY CAN WE SEE? When you look up and see the Milky Way, you're gazing into the heart of our home galaxy. What, exactly, are we looking at? BI Answers: How many planets in the universe have intelligent alien life? More important than finding life on another planet would be communicating with those life forms. Do aliens engage in practices like philosophy, religion, mathematics, medicine, and war? The only way to truly find out is to communicate with them. Until the 1960s, however, no one had even thought about how many intelligent civilization might be out there. It took the innovative mind of Frank Drake, an astronomer and early pioneer in the search for extraterrestrial life, to find a way to answer this question. His simple, yet comprehensive, equation that he developed in 1961 is named the Drake Equation in his honor. The Drake Equation is intended to help clarify the kinds of things we would need to know to figure out how many intelligent civilizations like ours exist in our galaxy. It estimates the number of intelligent civilizations that we could detect or communicate with in our galaxy based on seven parameters. R*: How fast stars form in our galaxy. fp: The percentage of stars that have planets. ne: The number of earthlike planets around each star that has planets. fl: The percentage of earthlike planets that develop life. fi: The percentage of planets with life that develop intelligent life. fc: The percentage of intelligent species that go on to create technology that could be detected by an outside civilization like ours. One example of this is radio signals. L: The average number of years the advanced civilizations release detectable signals. When you multiply the first three numbers (R*fpne) together, you get the rate at which earthlike planets are formed in our galaxy. The next three components (flfifc) tell us how likely it is that an advanced civilization like humans would evolve on an earthlike planet. Dwarf galaxy DDO 68, captured by the NASA/ESA Hubble Space Telescope, was one of the best candidates so far discovered for a newly-formed galaxy in our cosmic neighborhood. The galaxy lies around 39 million light-years away from us; although this distance may seem huge, it is in fact roughly 50 times closer than the usual distances to such galaxies, which are on the order of several billions of light years. Astronomers usually have to peer very far into the distance to see back in time, and view the Universe as it was when it was young. This new NASA/ESA Hubble Space Telescope image of galaxy DDO 68, otherwise known as UGC 5340, was thought to offer an exception. This ragged collection of stars and gas clouds looks at first glance like a recently-formed galaxy in our own cosmic neighbourhood. But, is it really as young as it looks? Hubble observations were carried out in order to study the properties of the galaxy’s light, and to confirm whether or not there are any older stars in DDO 68. If there are, which there seem to be, this would disprove the hypothesis that it is entirely made up of young stars. If not, it would confirm the unique nature of this galaxy. More complex modelling is needed before we can know for sure but Hubble's picture certainly gives us a beautiful view of this unusual object. The image is made up of exposures in visible and infrared light taken with Hubble's Advanced Camera for Surveys. Have you seen the largest picture ever taken? For the record, it's a mammoth 1.5 billion pixel image (69, 536 x 22, 230) and requires about 4.3 GB disk space. Oh, and it'll take your breath away. I do not care what science says .. What I seen and what happen to me was not from Present Earth only if they are timetravelers who have come back . If not out there it has to be here and if here it was not nothing like we know of technology. You know when you stare up at a ufo . It gives you such odd feelings . Creepy and eerie beyond belief . He doesn't remember seeing one, ever. I consider being 'wiped clean', a very very lucky status. (including wiped clean and no obvious side effects). Science has no proof that time travel doesn't exist Lois. We don't begin to understand it enough and hopefully it will be a long time before we do. There is also the theory that past..present..and future exist simultaneously or that all possibilities of a thing exist at the same time. Doesn't sound feasible to me but if there is one thing I do know..it's that the world..the universe is a lot deeper a place than we can begin to conceive of with our inadequate little minds...so limited by ourselves and the true killer..fear. Conquer that..and nothing can hold a person back. When it comes right down to it..what IS there to fear? Death? Well..that's just the next journey but since we don't KNOW it ahead of time..we cling to that which is safe and familiar..and..we eventually..die anyway. Seeing a UFO would be a really exciting thing for a lot of people. Meeting the occupants..maybe not so exciting. In honesty..which of us would change it? Can you envision your life if such had never occurred? And we wouldn't be here if our memories had been wiped completely..would we? Did it make us stronger? More inquisitive? Anxious to bring those stars close..to grasp a look? More spiritual? More questions? Isn't that all good? I don't do 'boring' very well. Facing the same day..doing the same things..thinking the same things..I might have been that person...if not for something that jolted me into the next reality. I wouldn't be me. It's taken me awhile..but I like the me I am and I think I'll keep me. Fact is..I will always believe..that if you are meant to 'experience' you most surely will. Of everyone I know Lois..your abduction/encounter is the most intense. And if you feel in your wise bones that it had something to do with time...I don't doubt it at all. I was only thinking if not from there it must be here. The one thing I do remember but don't remember . I woke up and was walking down the hall then I turned into the kitchen not fully awake. I have to have coffee or I never wake up. My husband was moving about but don't recall what he was doing in the kitchen. I only remember telling him. They are time travels. He laughed and said who is? He did not remember me trying to wake him up or that he told me the beam was the search lights from the airport. I had to say that for some reason. I don't recall dreaming a thing when I woke. Timetravels always come to mind when I vision the Saturn ufo at 4 years old. That holds more truth to me than all the hashing and rehashing over ufos since. With me it has always been as they say your first your first thoughts are usually the right one. It is not really that important to me. I just want to remember. I think I can take the truth without having a mental breakdown. After all I have read a thousand cases it seems on abduction. Could mine have been different from those poor people. ? I want to see a UFO! I keep my eyes open for them all the time. Me too Sky. I'd love to see one. Early the next morning ( around 4 a.m.) Kelly's oldest son told us of an object he witnessed which was flashing and made a circle. My daughter showed up about an hour later and said her and a friend saw something . She didn't know about Kelly's son seeing one( she was at the river fishing and described the time as being the same with Kelly's son). A galaxy far, far away — farther, in fact, than any other known galaxy — has been measured by astronomers. The galaxy EGS-zs8-1 lies 13.1 billion light-years from Earth, the largest distance ever measured between Earth and another galaxy. The universe is thought to be about 13.8 billion years old, so galaxy EGS-zs8-1 is also one of the earliest galaxies to form in the cosmos. Further studies could provide a glimpse at how these early galaxies helped produce the heavy elements that are essential for building the diversity of life and landscapes we see on Earth today. By combining observations from Keck, Spitzer and Hubble, the researchers say they can estimate that the stars in EGS-zs8-1 are "between 100 [million] and 300 million years old." But Oesch said it is difficult to know how old EGS-zs8-1 is compared to other galaxies at a similar distance from Earth. It is, however, one of the oldest galaxies yet measured. The new observations also show that EGS-zs8-1 is forming stars 80 times faster than the Milky Way. In addition, the still-growing galaxy has "already built more than 15 percent of the mass of our own Milky Way today," Oesch said in a statement from Yale University. The light from EGS has traveled a distance of 13.1 billion light-years, so the light shows EGS-zs8-1 as it was 13.1 billion years ago. At that time, the universe was only about 670 million years old, or about 5 percent its current age of about 13.8 billion years, according to a statement from Yale. The first stars began forming about 200 million to 300 million years after the Big Bang, according to Oesch. Astrophotographer Shreenivasan Manievannan sent in a photo of the Milky Way arching over a rock arch in Joshua Tree National Park, California. Photo submitted May 1, 2014. This heavenly view of the Milky Way was taken in the South Pacific paradise of Mangaia, the most southerly of the Cook Islands. This image was chosen as one of the winners of the National Maritime Museum's Astrophotographer of the Year 2011 Contest. This image of the Andromeda Galaxy, Messier 31, also shows its satellite galaxies, Messier 110 (top) and Messier 32 (lower right of M31’s nucleus). Dust lanes between the spiral arms of M31 can be seen in large amateur instruments, but the bright nucleus, M32 and M110 are easy targets for small telescopes. A 65mm f/6.5 refractor and Canon 1100D DSLR were used to capture this portrait of our largest galactic neighbour from rural Norfolk on 29 November 2013. Magnitude +4.5 nu (ν) Andromedae is the blue star in the lower left. Image credit: Ade Ashford. Now that the British Isles are no longer experiencing twilight all night, keen observers are already looking forward to the ‘season of mists and mellow fruitfulness’ with its dark skies at a sociable hour. Is it too soon to be thinking of autumn? Possibly, but the equinox is almost five weeks away. During the annual Perseid meteor shower vigil, my thoughts and gaze often turn to one of best deep-sky objects of the approaching season that is now accessible low in the east-northeast by 11pm BST — the Andromeda Galaxy, or Messier 31. By the middle of September, it can be observed at the same position by 9pm. Some 2.5 million light-years away, M31 is often quoted as being the most distant object that we can see with the unaided eye on moonless nights from locations free of light pollution. Around 220,000 light-years in diameter, M31 is a spiral galaxy about 1.5 times larger than our Milky Way, making it the largest member of the Local Group. It could contain a trillion (1012) stars. At its stated distance the Andromeda Galaxy has an angular size of about 5 degrees — the same as the apparent field of view of a typical 10×50 binocular. 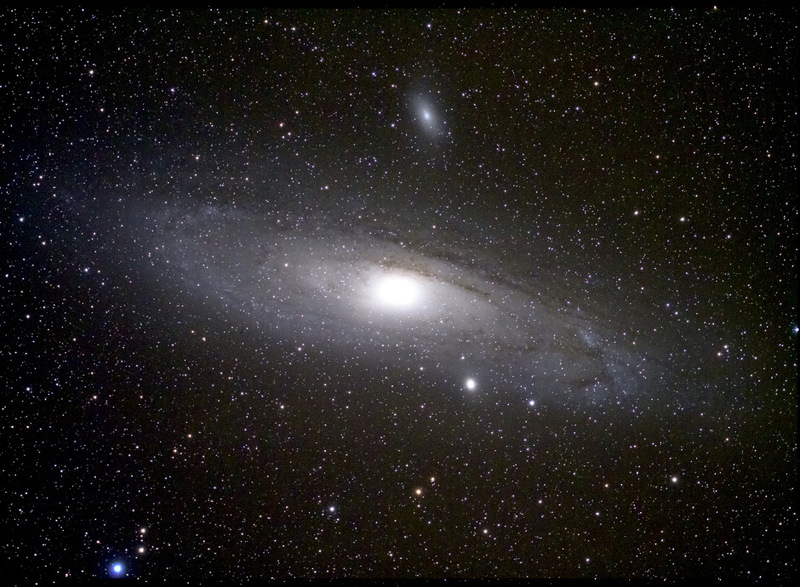 For this reason, when it comes to making observations of M31, very low magnification instruments under very dark skies will often deliver the most memorable views.